Saying that liberals are weird and touchy is like noting that the sun is hot and water is wet. Granted, some of that is pure politics. For example, the big story of the week is that Donald Trump convinced North Korea to free three hostages. Surely liberals must be happy about that, right? Here are some of the mainstream media headlines about that diplomatic triumph. CNN: Why Donald Trump talked about 'ratings' standing next to 3 recently freed prisoners? Are these ridiculous headlines given the situation? Absolutely, but politics is politics. All these media organizations are in the tank for the Democrats and they don’t want to see Trump do well. So, their bias may make you roll your eyes, but it’s understandable. You might want to make a similar argument about the incredibly obnoxious article Ta-Nehisi Coates wrote this week saying that Kanye West became a white man when he supported Trump. You may think I’m kidding, but the title of his piece is called “I’m Not Black, I’m Kanye.”If I used that exact same logic and wrote a column called “You’re Not A Good White Man If You Don’t Vote Republican,” the same liberals who cheered what Ta-Nehisi Coates wrote would go insane. Now, you could chalk all this up to, “They’re just hypocrites that want to win elections,” but that undersells it. 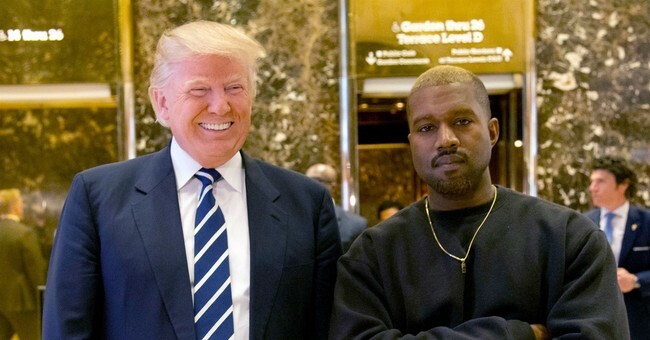 Ta-Nehisi Coates and other liberals are genuinely offended that one prominent black singer is supportive of Trump and has an open mind about political ideas from the other side. They are so desperate to be offended that a single prominent black man simply disagreeing with them about which political party to support drives them out of their minds. Incidentally, it doesn’t just work that way with celebrities. Last week, a young black woman named Channnnwrote a post about how her dad had a flat tire and a white guy wearing a Confederate flag t-shirt stopped to help her. She admitted that she wasn’t a fan of the Confederate flag, but went on to acknowledge that other people might not see it that way and that whatever the case may be, the guy who helped her was a nice guy. It’s a great story, right? Well, not to some people. One of Twitter’s most better known liberals, Tariq Nasheed who thinks EVERYTHING is racism and white supremacy concluded *** surprise *** that this was just more white supremacy. In other words, the guy that fixed her tire was victimizing her by maintaining “SYSTEMATIC white supremacy.” So, yes, if you were wondering, according to liberals you can be victimized by a good Samaritan who stops to change your tire. Last week at a website called “the Feed,” a column called “Opinion: 8% Of Prisoners Are Women. That’s About 8% Too Many” was written. In the article, it is suggested that we should effectively eliminate the threat of prison for females because, “Women never commit the most heinous offences.” So prisoners are victims for no other reason than because they’re female. But, what if a woman does something that allows male liberals to claim they’re offended? Then, they’re happy to go after women, too. A couple of weeks ago, an attractive young white high school student named Keziah Daum wore an Asian-themed dress to her prom and tweeted out a picture of it. So what, right? Except, a young liberal tweeted “My culture is NOT your god*mn prom dress.” That tweet received 179k likes, led to both tweets going viral and happily, has spawned an almost limitless number of memes making fun of the ultra-sensitive liberal. At some point in history, all cultures have taken slaves, have fought and oppressed other cultures to take land and have appropriated things from other cultures. Becoming furious because someone wears a prom dress from a culture you identify with seems insane on the face of it. It would be like an American yelling at someone from London for wearing a cowboy hat or being outraged because a Canadian wears a Yankee jersey. This is not something psychologically healthy people get upset about. The fuss started when Richard Ned Lebow, a professor of political theory at King’s College London, and Simona Sharoni, a professor of women’s and gender studies at Merrimack College, ended up in the same crowded elevator during a conference at a Hilton in San Francisco last month. She said she offered to press the floor buttons for people in the elevator, whom she described as mostly conference attendees and all, except one other woman, white middle-aged men. Instead of saying a floor, Lebow smiled and asked for the women’s lingerie department….Sharoni wrote in a complaint, the details of which he disputed, to the association later that day. ...After glancing at Lebow’s name tag, Sharoni says she went back to her hotel room to check out the association’s code of conduct. She then wrote to Mark A. Boyer, the association’s executive director. He forwarded the complaint to the group’s Committee on Professional Rights and Responsibilities, which determined that Lebow had violated the conduct code. This may shock you (ha ha), but the world’s most humorless woman is a professor of women’s and gender studies. Who would have ever guessed? Perhaps the worst storyline out of all of these issues is the “Someone calls the police on a black person; so all of us should be outraged” stories that have started to become prevalent. At Starbucks, a black manager who had a problem with loitering in her store called the police aftertwo black customers refused to leave or buy anything. A neighbor called the police on three black women and a white woman after she thought they were acting suspiciously. Apparently, they were also rude to her according to the homeowner. In another case, a white student at Yale called the police on a black student who was sleeping in a common area. In every one of these cases, these were treated as racist incidents even though there is absolutely no evidence of that. Of course, liberals love to use whatever they’re outraged about today as an excuse for government action or to gin up their base, but at the most fundamental level, liberal outrage is all about shutting up everyone who doesn’t agree with liberals. That’s the ultimate form of censorship. When you’re so scared that you might offend a liberal that you censor yourself. When you don’t wear the prom dress you want to wear. When you don’t make the joke. You don’t say anything that might make a liberal angry because you don’t want to deal with formal charges or 5,000 outraged liberals on Twitter that feel justified in calling you the worst names you’ve ever heard of because their widdle feelings are hurt. You can give in to their bullying if you like, but down that road lies a new liberal vision of totalitarianism where the bad guys win not because they deserve to or because they have guns pointed at your head, but because people are too afraid to speak the truth. For your sake, for the sake of your kids and for the sake of your country, don’t let liberal outrage determine what you can and cannot say.